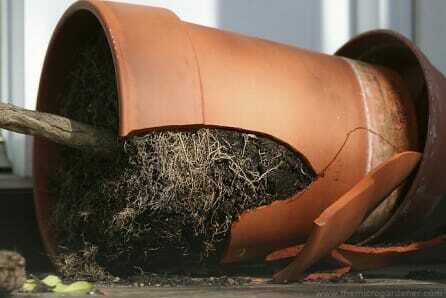 The first fatalities were these new pots discovered on my verandah broken into large pieces. The culprit hasn’t owned up yet and I have both 2 and 4-legged suspects! I got a confession for this one – it was crushed by a falling branch = unprepared husband with chainsaw!! And not to be outdone, our gorgeous but boisterous dog was busting to make an appointment with nature. She bolted out the front door and there was another fatality on the porch. This aged but well travelled pot had made it through 4 house moves but couldn’t survive this one! 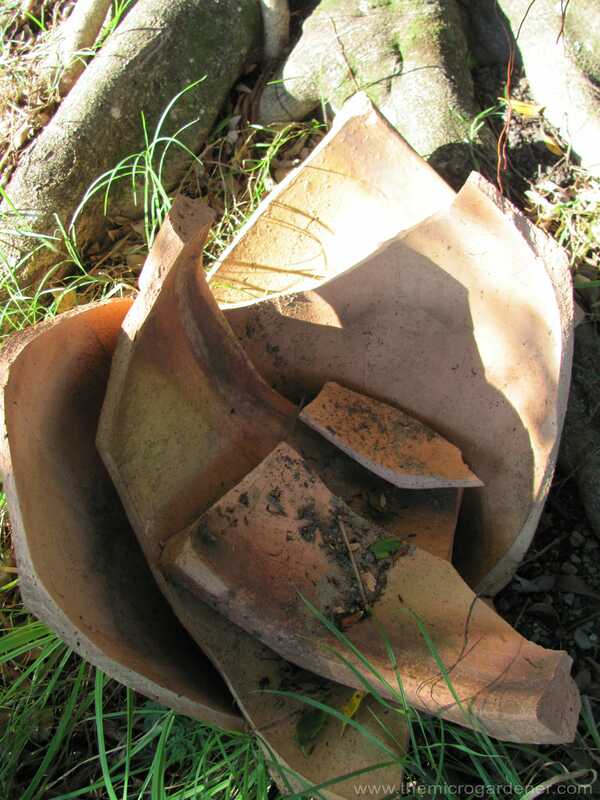 With a pile of cracked pots, I started to wonder: What exactly CAN you do with them? All that embodied energy seems to be such a waste. 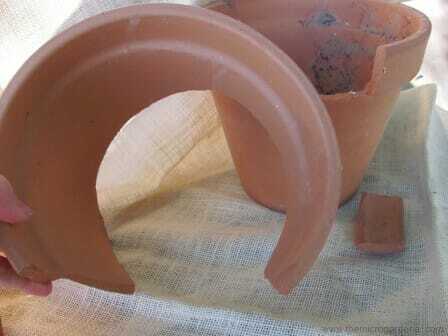 After doing a little ‘digging’ I’ve realised broken pots may actually be an opportunity in disguise! I’m always looking for ways to upcycle any resource that could still be useful. 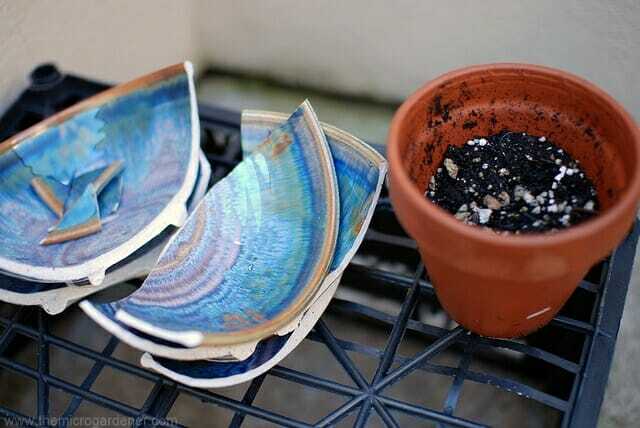 So I hope my ‘shattering’ story will inspire you to get creative when your pots or crockery get smashed. All is definitely not lost. 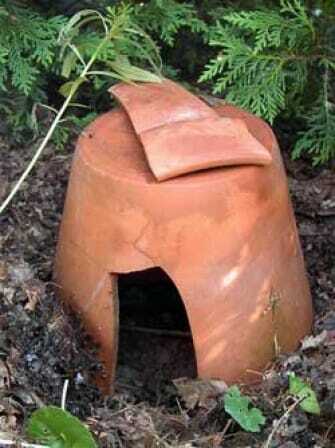 They can still find a useful home in your garden – and sometimes in a way you least expect! 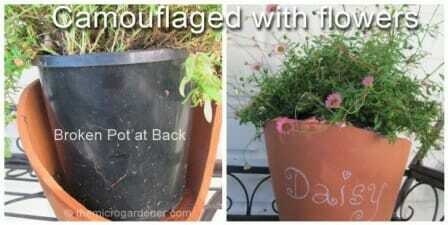 My first idea was to use one of the large pieces as a cachepot to hide an ugly black plastic pot. The terracotta was still half intact. A bit like those hospital gowns that look good from the front but are open at the back! 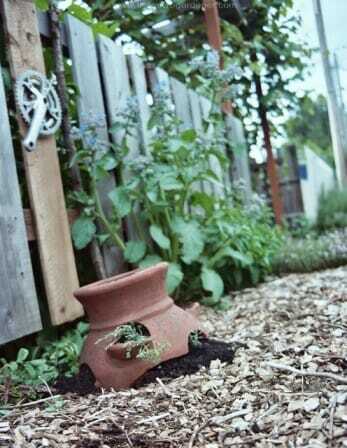 … To disguise this one, I sat the pot inside and used the terracotta pot as a plant marker. With this pot having lost the rim and back, I have used it as a decorative cachepot with dwarf seaside daisy that cascades over the edges to hide its true condition. It’s positioned against the wall on my plant trolley. Should you use Broken Pot pieces as Drainage? 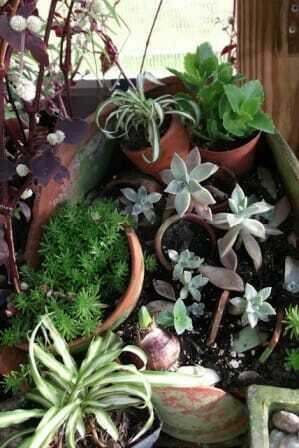 Like many gardeners, I used to add a layer of crocks, pot shards or gravel to the bottom of pots. I used to think this would help with drainage. However, there is scientific evidence that the practice of adding larger pieces actually slows down the water rather than helping it flow. The opposite effect of what you are trying to achieve. 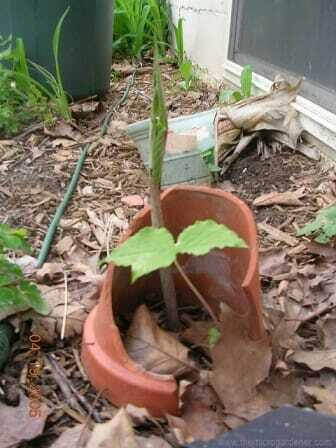 Instead, there are many other uses for small broken pot clay shards. 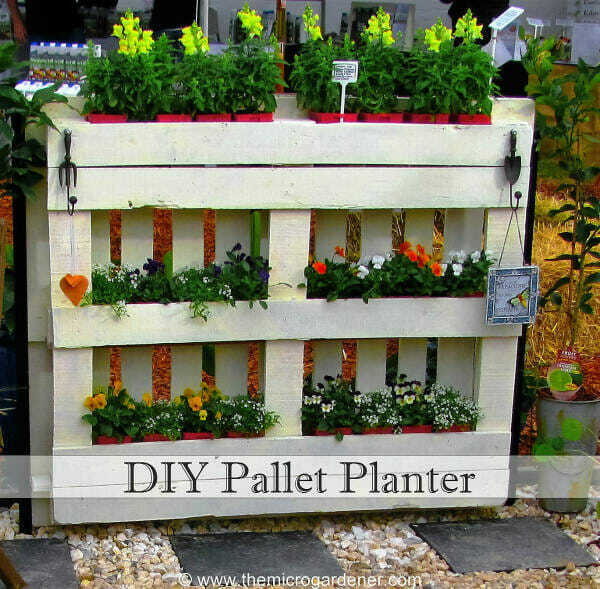 Small pieces can be used as a protective moisture holding decorative mulch in your planters. Helpful for keeping animals & birds out too. 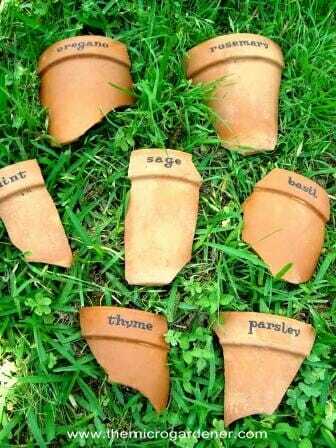 Another way I have used smaller broken pot shards is as DIY plant labels. You can use a wax pencil to write on them, stick on letters or add a little paint. 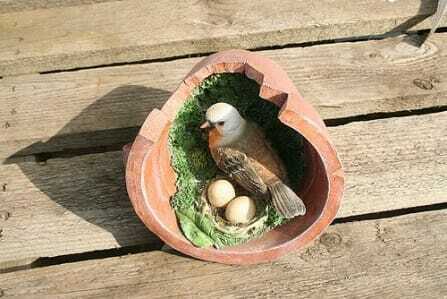 Turn it into unique garden art like this bird’s nest. Add some moss or paint the inside green and add some pebbles, statue or other objects that take your fancy to create the look you want. 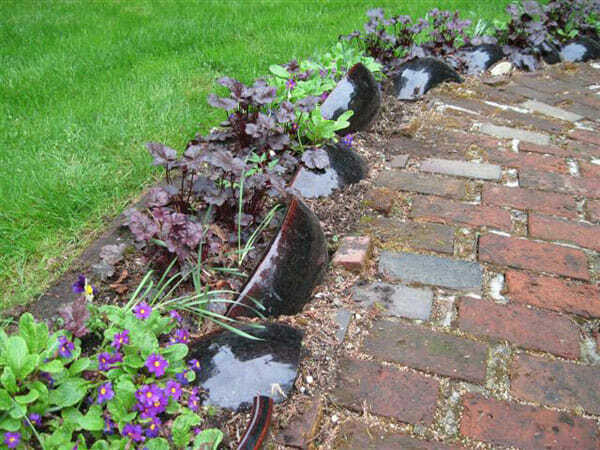 Another way to use large curved pieces is garden edging for small spaces. 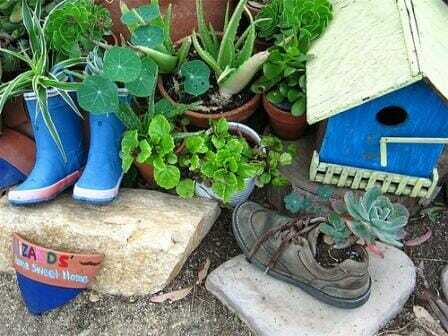 If you have children or grandchildren, try creating miniature garden art or fairy gardens for kids just for fun! Imaginative play and connecting to nature is so important in the development of our children. A rustic combination with this weathered chair and pot plant collection. Ornamentals and edibles like thyme and oregano make attractive ground covers and succulents need minimal care. 3-storey miniature garden with a stone path, sempervivum (hens and chicks) leading up to the door and rooftop bird house! 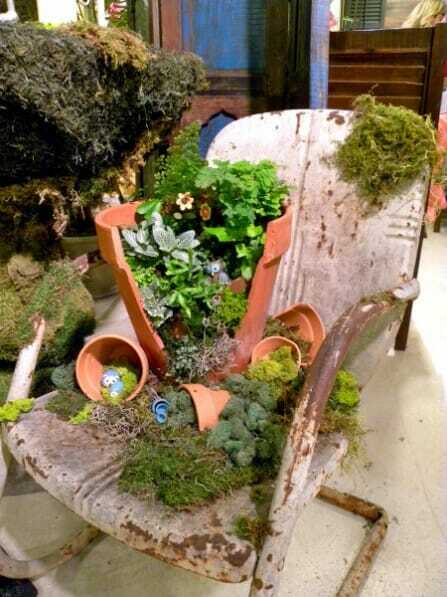 A very creative miniature garden design with steps, moss, succulents and even tiny furniture! 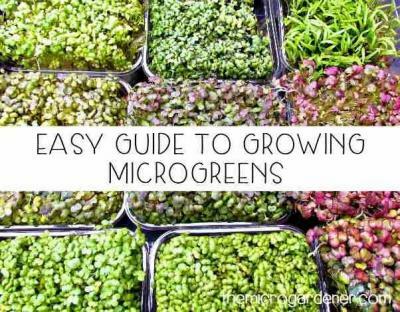 If you’re inspired to create a miniature pot garden, check out this tutorial for the basic steps to get you started. 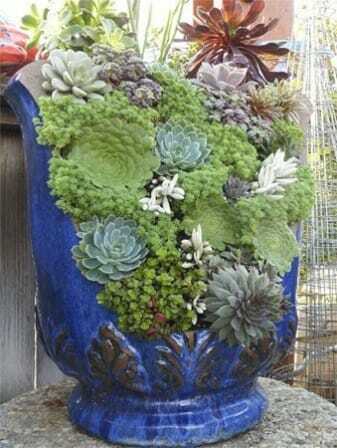 Succulents have been used beautifully to fill the front of this decorative blue pot. 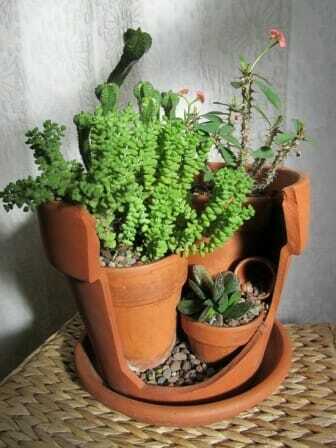 I love how height was created to add interest in this tiered succulent container garden made with broken pot pieces. 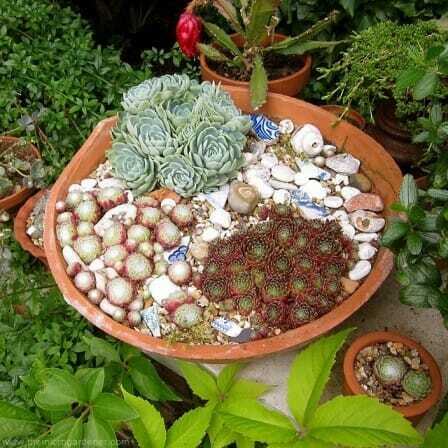 A combination of shells, blue pot shards and succulents in this broken saucer work really well together. 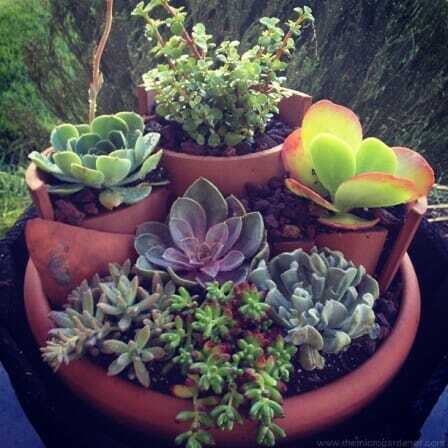 A simple succulent garden in mini pots stacked inside an upcycled pot. 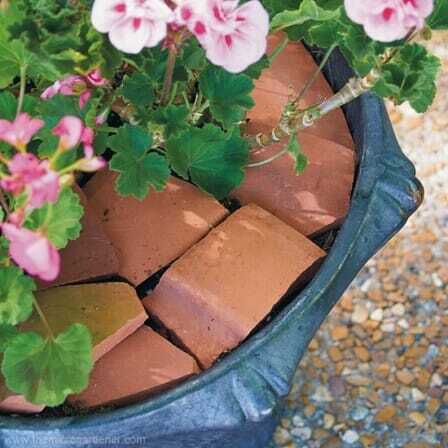 Reuse part of your broken pots if they still have some useful planting spaces. The top of this strawberry planter could still be salvaged. How about a little plant protection? 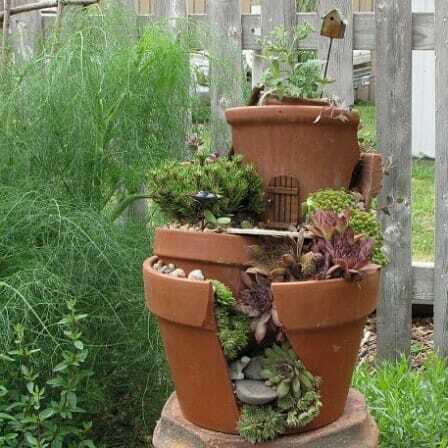 With a little imagination broken pot pieces can also provide habitat for garden creatures and beneficial insects. A piece of terracotta has been painted with ‘Lizards home’ – a cool retreat up against the rock. 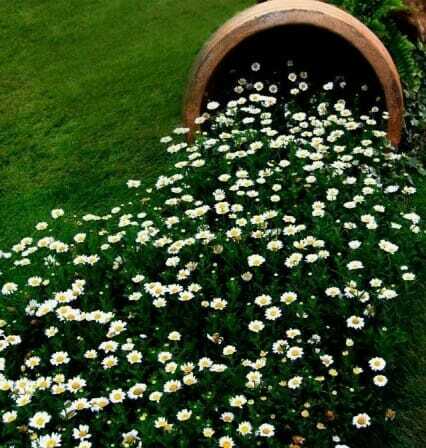 Adds colour & is a fun idea for kid’s gardens. Or perhaps if you have a little patience, try creating an Insect Hotel. Accommodation for beneficial insects like solitary bees and wasps that pollinate your food crops and flowers. 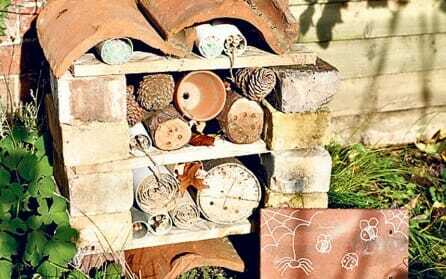 Multi storey insect hotel made with recycled natural materials and pots. 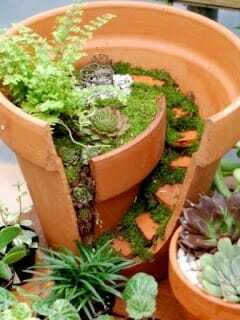 Even a simple upturned pot can provide a safe haven for frogs or lizards seeking shelter and helps keep your garden in balance as they keep your insect population in check. And, if you’re a little crafty … you might be able to use broken crockery as well as pots in your garden. 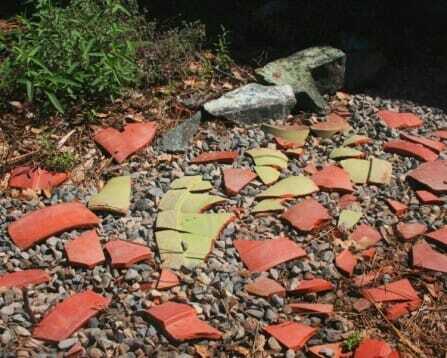 Using goggles and a hammer, colourful pots and kitchen crockery can be broken up and used for mosaic projects. 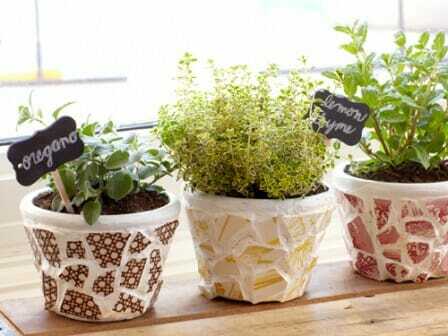 Upcycle broken pieces into a work of art mosaic pot! Repurpose your broken glass stemware as an outdoor citronella candle holder to keep bugs away! 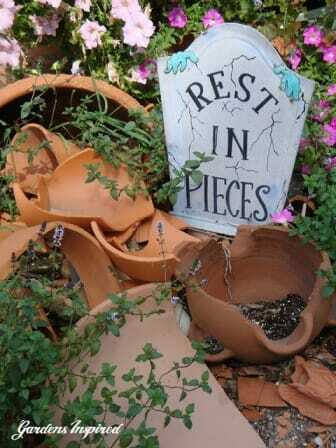 Or you may just decide to set up a garden graveyard for your pots and enjoy them as a collection! 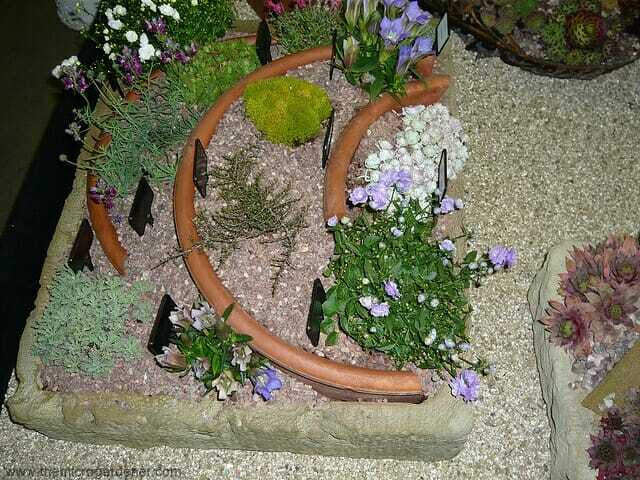 Clay pot resting place … adds a little humour and garden art. 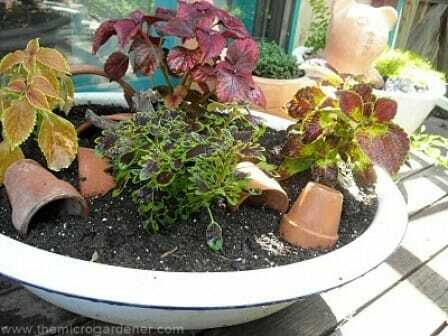 Create a spill pot by growing trailing plants to cascade down the sides or out the front of a pot laid on its side. Upturn and use as plant stands. In your pond, water garden or fish tank as a home for aquatic life and frogs. 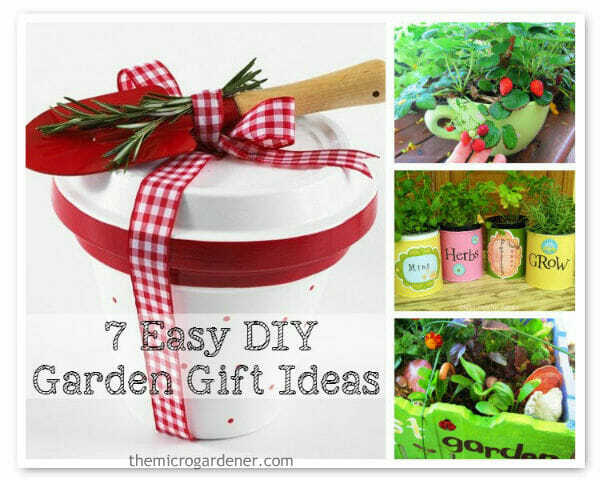 Minimally damaged pots can be used to store seed packets, tools and other small garden accessories. Group pots in a collection and hide damage by positioning another pot in front. 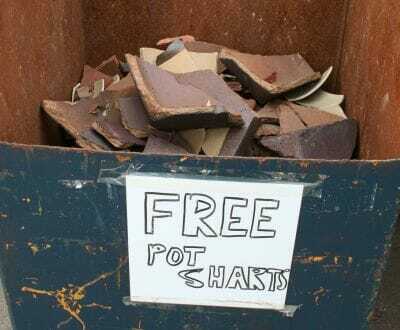 If a pot is REALLY precious or one-of-a-kind, you may want to try and repair it and save money. Pottery Magic shares some helpful tips. 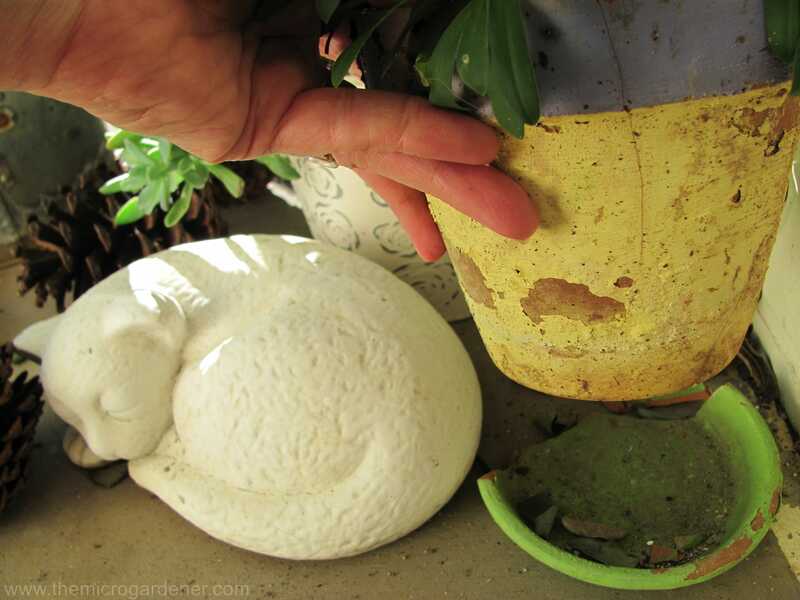 However, remember if you are going to use chemical glues to repair a pot, I would urge you to avoid growing food in it in case chemicals leach into the soil. 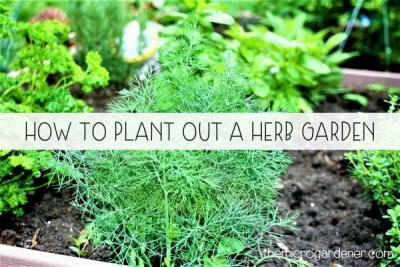 Not so important for ornamentals but definitely, edibles! Inspired but no broken pots? Many businesses have the problem of getting rid of ‘waste’ when this may be your solution to free garden art materials! Why not contact your local pottery centre, nursery, craft supplies, landscape yard or outdoor living stores? You’re sure to pick up some pieces. So between four-legged culprits and power tool wielding husbands, I’m resigned to the fact there will be more cracked pots around here. But at least I have discovered some creative ideas for how to repurpose them in my garden. So, next time a pot breaks – an accident, the wind, freezing temperatures, a boisterous animal, kids (or husbands) – I hope you have some inspiration too! 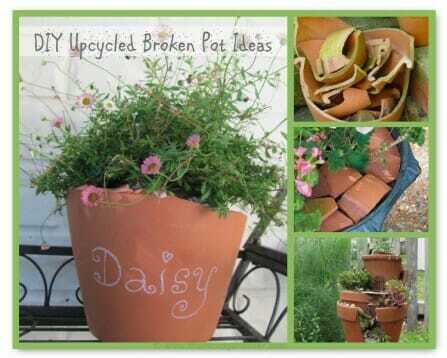 I’d love to know how you upcycle broken pots at your place. So please share your tips and ideas in the comments. i. the house is on first floor. iii. I am a total jerk loser when it comes to creativity! Shall try a few of these ideas, though. Am planting 10 types of seeds over the next 2 days. As always, you are incredible, it is so fabulous !!! Thank you so much. Thank you so much Bernadette! Glad you enjoyed the ideas. May you have a wonderful Christmas & New Year also. D’oh…. 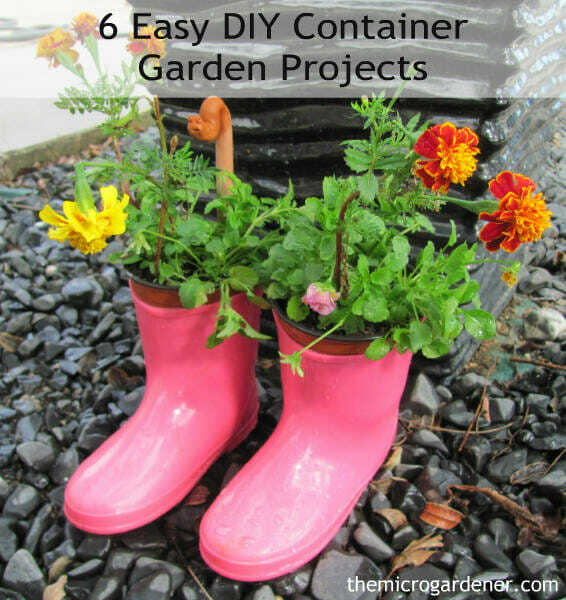 was hoping for some ideas on broken plastic pots! I don’t use terracotta here (Melbourne) because the plants dry out too fast. So far, I’ve only found a few solutions – repair very small cracks/holes with waterproof tape, and cutting out the bottoms and using them as either a small personal compost bin for hungry trees/plants (shove them a little under the soil at the root line and fill with good stuff to break down as nutrients) or again, shove them a little under the soil and then make a single plant/small plants no-dig garden. I love this post. So many great ideas. Thanks for sharing. What a great round up! I love the little, magical scenes built in the broken pots. 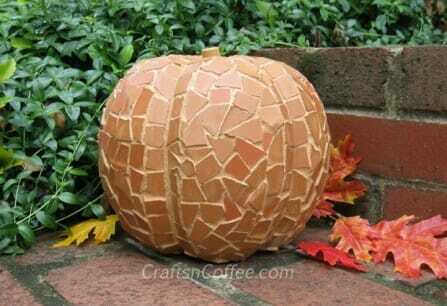 Thank you for including the Terra Cotta Mosaic Pumpkin from Crafts ‘n Coffee, too.